OK, things have got pretty hectic. First was Alex and Andy the electricians arriving—as expected. What I’d failed to do was ask what I should have got in ready. So I was off to the local supplier for more cable, back boxes etc., than I would have thought possible. This was pretty stupid of me as I’d already bought all the sockets and 2nd fix items, so why did I not think about the cables? Well, partly it was because this had not been fully discussed. Almost all of the mains cabling would run in walls, rafter space and floors—buried in insulation. To meet the standards it must be run in conduit or de-rated. So a 32A ring would need to be run in 4mm2 cable. Expensive. Alternatively, you can have a 20A ring instead using the normal 2.5mm2 cable. Very few appliances in this house will draw significant power. This is discussed in a separate section under Definitions. The other excitement is that the solar PV has become operational.. Without any fuss, it’s just well, been connected. And the meter flashes away (1000 flashes/ kWh). I must get on with having it registered. Solar panels – now working! Now, I probably haven’t got this completely right, but at least I’ve tried. Given that all the walls and floors and rafters are to be filled with Warmcel 500, the opportunity to make changes later is reduced. Indeed, for all but the simplest of changes it’s either unacceptably messy and expensive or at best very difficult. So if a cable isn’t there, we’re going to have to live without it. There’s another section under Definitions about trying to future-proof the house. The scaffolding has had to be altered to let the roofers access the roof safely to put in the heavy rooflights. What started as a generous 6 board scaffold has become a very narrow, barely 2 board one as soon as the deep overhangs had been completed—so the scaffolding has had to be extended to allow ladders to be planted against the toe boards and held clear of the lower slates. This has allowed 4 of the six rooflights to be fitted. At the same time most of the smaller windows have been fitted, which has suddenly changed the feel of the house. The 3 huge windows/doors need more people to move them—they’re 2.5 by 2.8m. Next week! The Easter weekend has allowed some more time to walk the house and see what needs doing. Just as well. We’d changed the way one door hung—and failed to tell Alex. So I’ve had to re-run all the cables to it myself—pity there were 5! 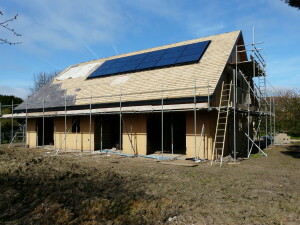 This entry was posted in Electrics, Solar PV, Solar thermal. Bookmark the permalink.